This photo was taken several years ago when I had to clear some twine out of a nest. They are one week old Osprey chicks. Once again all the field work takes so much time I do not get around to posting info for people to read. The chicks are beginning to hatch and I have been able to see chicks already on a few nests. They usually are not visible until they are at least one week to ten days old. I have seen their tiny beaks reaching up for food and some sibling rivalry, establishing the "pecking order", literally! There is a phase when they do peck at each other and determine the dominant chick and subordinate chicks. This order is usually followed during feedings. I have never seen siblicide, but it has been reported in the literature. Ospreys are generally not very aggressive birds and most Osprey chicks do survive the sibling rivalry. There are so many interesting behaviors at this time. Today I noticed one male was sitting on the nest perch, with a perch! He was eating, but he stopped every few bites and looked at the female sitting in the nest...checking for a signal that she wanted food. She sat quietly for a while and then she stood up and he went to the nest immediately with his fish. Oddly, she picked up a whole fish off the nest and flew off...but returned very quickly without the fish. I believe she was discarding an old fish. ( This male must be a very good provider if they are discarding fish!) She then took the fresh fish from the male and began taking small bites and leaning into the nest cup and offering it to the chicks. I could not see the chicks, but this is how we can determine that hatching has occured, by observing this feeding behavior. The male sat on the nest edge and watched, staring into the nestcup. Now incubating turns to brooding, and the difference can be hard to determine. I have seen so many hatches for 19 years that I do get a sense of what is going on quite quickly...the restlessness, rocking and wiggling of the female, a slight change in the body posture, staring down as she sits, getting up part way to peek beneath. The male will often stand on the nest edge waiting for a look at the chicks. This morning as I was waiting for a clue from one female, she stood up and carefully picked up a beautiful half of an osprey eggshell and moved it to the side! So, we have more Ospreys than we did a week ago! Yeah! I also investigated a problem nest on an active power pole and shared my insights on Osprey behavior with Xcel Energy. It appears that the problem is now resolved. I appreciate Xcel Energy's interest in doing the right thing when the Ospreys begin building nests on their structures. So once again I say, THANKS to the donors and to Xcel Energy! Sadly, we have reached the point in the nesting season where it appears that some nests are starting to fail. I visited a nest that had been incubating for the past few weeks but I found the female struggling with a large piece of landscape fabric that they hauled up there. She tugged and pulled and pushed and tucked and yet it remained in the way. She did not sit in incubating posture the entire time I was there (almost an hour). I am wondering if the eggs are under the fabric. I hate it when they do stupid things. But Ospreys are known for picking up odd stuff to line their nests...over the years we have found hats, gloves, a lanyard with keys on it, an arrow, twine (lots of killer twine), plastic bags, etc. I found another nest totally empty. No clue about what happened there, tho I am not sure they laid eggs at all. With well over 80 nests to monitor, its hard to visit as often as I would like. I have identified 79 birds by their bands so far, with a few difficult birds still elluding my prying eyes. I am sorry I have not found time to post much here lately. Please check the facebook page if you are on FB...there are more frequent posts there. I realize that many people are not on Facebook however, so I will share some of those posts here also. I have been very busy doing the early season fieldwork. I have identified 72 Ospreys by their bands so far. Many nests are incubating now. 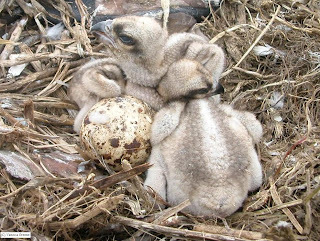 The earliest hatching will probably occur in the third week of May. Sometimes Ospreys that are not physiologically old enough to breed return and try to establish a territory. I was watching one of them yesterday...a 2 yr old female with an older male. I have never seen a 2 year old lay eggs. Typically these young females are unreceptive to copulation, which seemed to be the case at this nest. Often these females do act dependant upon the males for feeding, but this one was getting her own fish and when he tried to offer her a fish, she said "no thanks, I already have my own". So they were just engaging in parallel feeding...eating side by side in a tree, and she was going off on her own and he was bringing sticks to the nest. I did not see her working on the nest yesterday and I did not see any copulations. When he tried to mount her, she did not lift her tail. So we call them "housekeepers"...if they just hang out together in this territory, but do not reproduce. We will see what happens! I have documented 2 year old males who attended nests where chicks did hatch, even tho it was previously believed that they were physiologically incapable of reproducing. I co authored a paper on the topic of 2 year old Ospreys and extra pair copulation that was published in the Journal of Raptor Research. I discovered that many ospreys were engaging in extra pair copulations, and that the females that were mated with these young males may have participated in copulations outside the pair bond. This may have explained the chicks that were being tended by these young males. 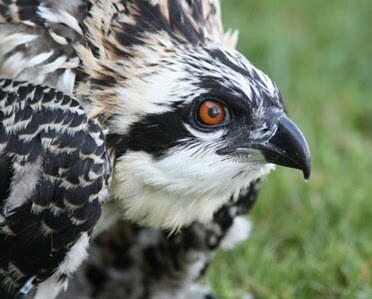 If you have any questions about Ospreys, please feel free to post it! I love to respond to your inquiries!